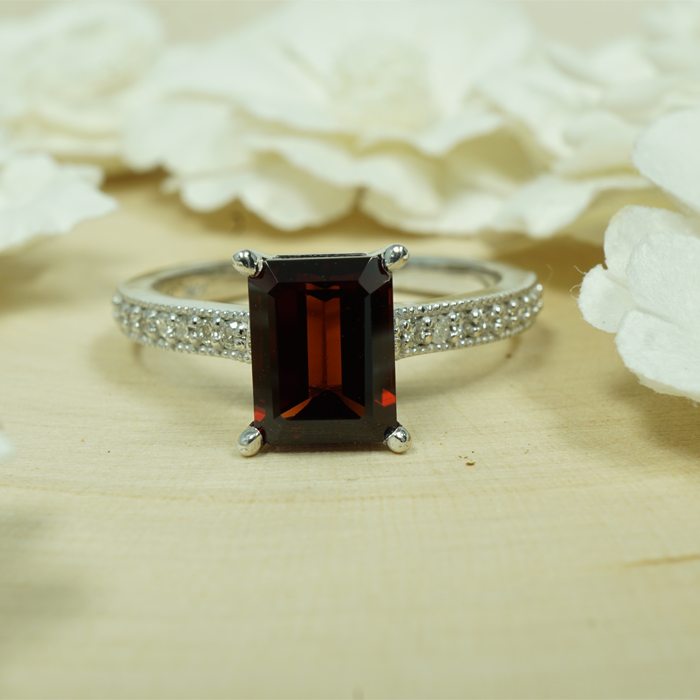 Garnet ranks at a 6.5 – 7.5 on the Mohs scale of mineral hardness, and a rating of fair to good in terms of toughness. Because it is only relatively strong, it will require a special care and frequent upkeep to maintain its condition. With proper maintenance, this gemstone can last for many generations. Whether you own a diamond or a talc gemstone, it is always important to handle it by its band or chain, and never by the actual stone itself. This prevents the gem from accumulating buildup of natural oils and other types of residue. Start your cleaning process by polishing the ring or stone with a 100% cotton cloth before applying water, as this will loosen up any caked-on residue or oils. Run lukewarm water into a bowl or sink – enough to completely submerge the stone. While the water pours into the container, mix in a teaspoon of mild liquid soap. If needed, place a towel or other protective material to the bottom of the sink to prevent any damage from the stone to the bowl. Let the gem soak for a few minutes to allow dirt and oils to loosen. With a soft-bristled makeup or jewelry brush, gently scrub the surfaces of the emerald. For multiple stones in one piece of jewelry, be sure to clean in each of the crevices and along the prong areas, so as to not miss any parts of the smaller stones. After scrubbing, rinse the stone with lukewarm water only. Do not use hot water. Repeat rinsing if necessary to ensure all soap and residue is removed. Dab the stone dry using a soft, 100% cotton towel. Try to avoid using your fingernails to get in each crevice. Put the gem in a safe, room-temperature place to fully dry. The stone should be completely dry before wearing. It should also be noted that although ultrasonic cleaner is generally safe to use on these stones, you should be careful not to use it on any stone that is cracked or has fractures. Steam cleaning is also not recommended. You’ll also want to visit a certified jeweler a couple times per year to have your gem thoroughly inspected and professionally polished. In doing so, you will ensure an even more intense brilliance in your ruby. Make sure to have the jeweler examine the stone’s mounting and setting, too, to see if it needs realigning. Garnet is not very strong in terms of mineral hardness, which means that it can be easily scratched or damaged if not stored properly. For example, if the stone is stored with other more-durable gemstones – like a diamond – it will probably become damaged. Because of this, it’s crucial to protect your jewelry as much as possible, so as to not scratch or chip any pieces and vice versa. It is also advised that you store each of your gemstones separately in compartmentalized boxes at room temperature. If your garnet becomes scratched or damaged, you should take your stone to a professional for repairing. At-home repair methods may cause more damage to your stone or other materials while attempting to repair.